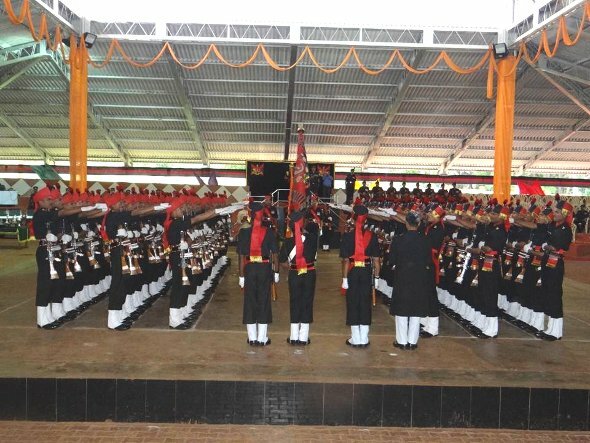 Attestation parade for the recruits of the Maratha Light infantry Regimental Centre was held today at 0730 hrs at Pandurang Salunkhe Boxing Arena of The MARATHA Light Infantry Regimental Centre. A batch of 131 recruits of group 6/11 who successfully completed their training were attested and will soon be going to different parts of the country in the service of nation. The parade was reviewed by Brigadier Santosh Kurup, Sena Medal & Bar , Commandant, The MARATHA Light Infantry Regimental Centre. The impressive oath taking ceremony was held in the presence of the National Flag and Regimental Colours. The young soldiers took oath to serve their motherland and to protect its integrity even at the cost of their lives. 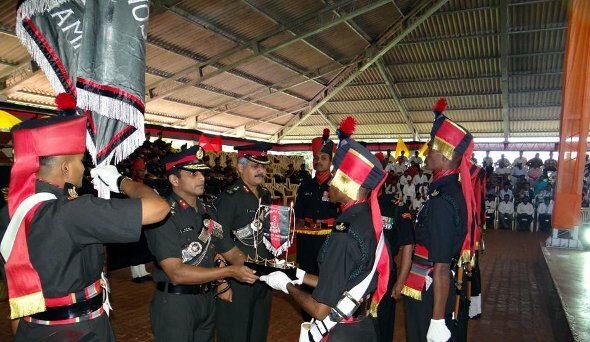 In his address to the newly attested soldiers, Brig Santosh Kurup , reminded them of their proud, regimental heritage and their commitment to the country’s security. He expressed confidence that the training in the Regimental Centre would stand them in good stead and wishes the young soldiers the very best in all their future assignments. The parade was commanded by Sepoy Wanje Dilip with the Parade Adjutant being Capt C Laldingzuala. The reviewing officer gave away various medals to recruits excelling in different spheres of training at the end of the Parade. Major SS Brar medal and Trophy for best in Physical Training was awarded to Sepoy Sayyad Dada Kalander. For Best in Field Craft Training the Col NJ Nair, Medal and Trophy was awarded to Sepoy Rajvir Mund. Honorary Captain Keshav Rao Talekar Medal and Trophy for Best in Drill was awarded to Sepoy Wanje Dilip. Suchcha Singh memorial cup and medal for Best in outdoor activities was awarded to Sepoy Yevale Ganesh, Sepoy Wavaskar Rishikesh was awarded Naik Namdev Jadhav medal and Firing Trophy for his performance in firing.